London, UK - It is always hard to find a perfect Hair, Beauty and Gentlemen’s Grooming place but that has changed. Naz Zeneldeen with his highly trained professionals is your go-to place, set in two contemporary and elegant salons side-by-side on Wandsworth Bridge Road, London. Naz Zeneldeen, owner of the Gentlemen’s Grooming Club, said today about his business, "Our new grooming club offers customers a unique experience, and not just a cut or shave. We have a highly personal approach and will tailor our services to each individual client. Also, we would have plenty of special touches, such as artisan whiskeys from around the world". Naz adds, "In the last year the business has gone from strength to strength, due to our loyal customers and the rapidly growing trend for gentlemen's grooming services. We are delighted to be in this strong position today, and thank all our customers for their support". The other side of the business, Hair & Beauty, is located next door, has been a successfully operating on the street for over 8 years, but recently underwent a stunning refurbishment. Now both salons are beautifully branded in blue and gold and leave a real impact on Wandsworth Bridge Road! 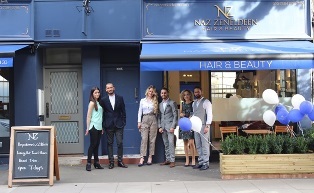 The Mayor of Fulham, Councillor Michael Cartwright said about Naz, "We are so happy to be here and support Naz's businesses, he has made an enormous contribution to the community in the form of his first class hair, beauty and gentlemen’s grooming services".